Did you ever wonder what it would be like taking orders at a coffee shop? Imagine the number of orders you’d have to remember daily. Well, maybe working at a coffee shop may not be as much fun as it is a necessity. 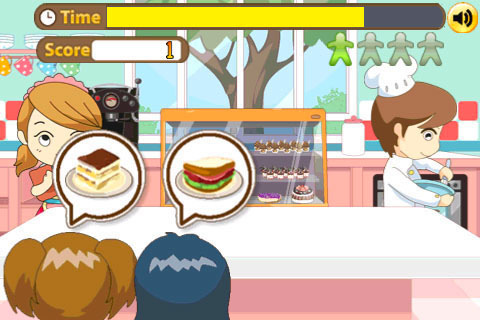 Mocca Software’s puzzle game, Cooking Memo: The Coffee Shop, certainly makes working in a coffee shop look like fun. The game is in essence a simple, matching puzzle game. You’ll help a cute anime-styled waitress take orders from incoming customers. The number of customers will range from 1 to 4. You’ll start off with 1 customer and have as many as 4 when you do your job well. Once you get the order, you’ll tap the screen and select (in order) the items to deliver to your customers. You’ll only have one shot at it so get it right the first time! There are 7 different items customers can order: cappuccino, coffee, chocolate cake, strawberry cake, orange soda, ham sandwich, and root beer float. Try to match as many orders as possible before you run out of time to increase your points. Get more than 4 orders wrong and the game immediately ends. Cooking Memo is a great take on the classic matching game. It’s easy to just pick up and play–no complicated instructions to read through. Controls are simple: just tap. Although the game is straightforward, developers could stand to make several improvements. Firstly, I’d like to see the lag time decreased when a customer’s order can be filled. As is, the delay slows down the amount of points I can accumulate during the timed limit. Secondly, I’d love to see the addition of a pause button or autosave feature. This might seem counterintuitive to the short, timed game but this feature would be great just in case someone is in the middle of a roll, but needs to take a break for whatever reason. Thirdly, although integration with online leaderboards is great, Cooking Memo lacks integration with a major social networking group like OpenFeint. For this reason, it also lacks achievements that users can unlock. Graphics are where the game really shines, but audio leaves something to be desired. The anime-styled characters are colorful, 2D graphics. Animations were a nice touch, although very limited. As for the soundtrack, it is an annoying, short loop that detracts from the gameplay experience. Developers should either change the soundtrack to something less obtrusive or develop the loop into something a little longer. Thank goodness the developers added an easily accessible audio button so you too will be able to mute the soundtrack. Overall, Cooking Memo does what it promises and fills a niche need: it is a great time-filler game for when you’re waiting for the elevator, bored at work, etc. It could certainly use some improvements. Having more food items to match wouldn’t hurt either. I’d love to see developers add classic coffee shop items like biscotti, scones, and muffins. You could get Cooking Memo if you have the $0.99 to drop, but there are better games out there for the replay value. AppSafari review of Cooking Memo was written by Linda Ta on April 22nd, 2010 and categorized under App Store, Asia, Fun, Games, Puzzler. Page viewed 3791 times, 1 so far today. Need help on using these apps? Please read the Help Page.